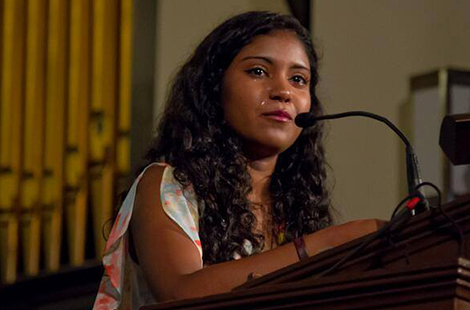 Tabitha Sookdeo went from high school to Capitol Hill to fight for immigration reform. She thought that was her only option. Sookdeo, a junior social justice major, is an immigrant student without legal status from the Caribbean, meaning that she immigrated to America legally but has not received a social security number. This means that she is unable to get a job, accept federal aid, get a license, or even open a bank account. Without the proper documentation, Sookdeo is denied freedoms that are often seen as a basic part of college life. Sookdeo spent her first two years post high school graduation throwing herself full force into immigration reform activism. What had started as a way to keep from going crazy turned into a passion to educate others on real issues facing real people. The first time Sookdeo was asked to share her story was on Capitol Hill. More than 65,000 undocumented students graduate from high school every year, according to a UC Merced University Journal article. With this label of “undocumented” following them everywhere they go, these students are left to fend for themselves when it comes to paying for higher education. After immigrating to the small country of St. Martin when she was very young, Sookdeo’s family was subject to discrimination and injustice. Sookdeo’s family contributed to the community and economy through her father’s construction company as well as to their involvement in the local church, where her parents were leaders. However, they were forced to leave the country when Sookdeo was 13 years old. The government renewed all of the family members’ visas except for hers, leaving Sookdeo’s parents to figure out the next step. Moving to Florida was filled with promise for Sookdeo and her family. But ultimately this too turned out to be a season of disappointment. Spending two years doing immigration reform activism opened doors left and right for Sookdeo. Soon, she was sharing her story in churches all over the country. While speaking at a church in Florida, Sookdeo met Joel Tooley, pastor of Tavares Narazene Church. Tooley approached Sookdeo with an offer she couldn’t pass up: an education at a four-year private university called Trevecca. Never having stepped foot in Tennessee, Sookdeo eagerly accepted the opportunity. International student advisor Rebecca Merrick said that Trevecca strives to embody Christ in all that it does, and that includes helping students without legal status. “We want to provide them the opportunity to go to college if they want to go to college. And it’s better for all of us. It’s better for the student because they get to fulfill their dream and life calling," she said. Trevecca works to provide these students with private scholarships. Because the scholarships are not funded by the government, these students are free to accept the aid. Sookdeo carries out this duty through community service of all kinds. From Trevecca’s urban farm to multicultural festivals to helping students register to vote, Sookdeo is there ready to lend a helping hand. Sookdeo is hoping to obtain residency by the time she graduates from Trevecca in the spring of 2017.